I am covetous of a small black self-compiled swatch book in which Steven Holloway, a fellow artist-in-residence at Kala, has recorded each and every one of his hand-mixed printmaking inks. There are no blues in this book, because every pigment is a genuine earth tone – no synthetics or pharmaceutically-derived hues – but the range of rusts and greens is vast and subtle. To make an ink, one needs the pigment itself – crushed to a fine powder, and a binder of some sort. The binder for watercolor, for example, is gum arabic, while oils are most commonly made sticky with linseed oil (though other lubricants, like walnut oil, can be and are used commercially). Printmakers require burnt plate oil, a form of linseed oil which has been set on fire to eliminate the elements that make traditional oils non-archival for works on paper. It is thick and gooey and honey colored, and what gives a finished print that very specific smell that will linger in the flat files for ages. 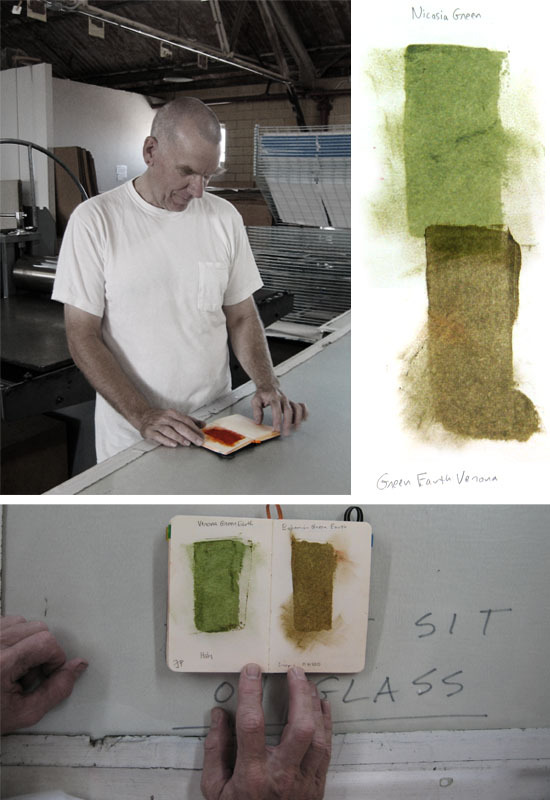 Steven uses pigments from Sinopia, but powdered pigment can be found readily at many art stores; they can also be found in one’s own backyard, as the article on Melvin Edward Nelson in this month’s issue of Art on Paper shows so wonderfully. This entry was posted in From the Studio, Photos, Work in Progress on September 16, 2009 by ellenheck. They’re finally here! A trade show in Las Vegas gave me the excuse to walk the Oakland Airport from the tip of Terminal 1 to the tail of the Southwest wing (as if the convention center had not satiated my desire to walk long distances). But I must say, the show is lovely. The Oakland Museum has done a wonderful job. The lighting is warm and inviting, and the prints – broken into three displays throughout the terminals – give a diverse, but coherent taste of the many things Kala has to offer. 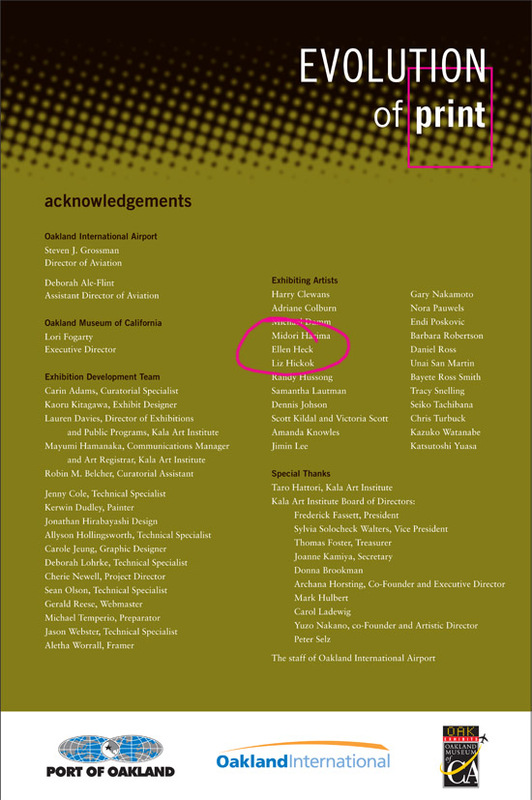 This entry was posted in Events, Kala Art Institute, Openings on September 16, 2009 by ellenheck. 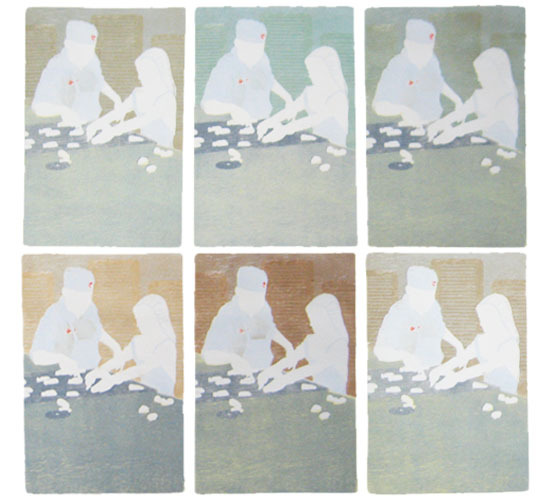 Today I ran a color test of six woodcut proofs for the next print in the Plus a Century series. As is sometimes the case, I chose “d) none of the above” but that’s what tests are for, right? This entry was posted in From the Studio, Work in Progress on September 4, 2009 by ellenheck. The highest-security show of which I’ve ever been a part (with the highest-dollar entrance fee): Evolution of Print: Artists of Kala is curated by the Oakland Museum and located in the gallery space between terminal 1 and 2 at the Oakland International Airport. (I believe that this is very near, if not right across from Hung Liu’s gorgeous glass cranes.) We have not yet gotten the clearance to see it (not having the necessary plane tickets to pass through security), but I will get back to you with pictures after a visit to my sister in Norfolk, VA. Happy traveling! Also, I’d like to thank Kaoru Kitagawa for having my pieces professionally framed. 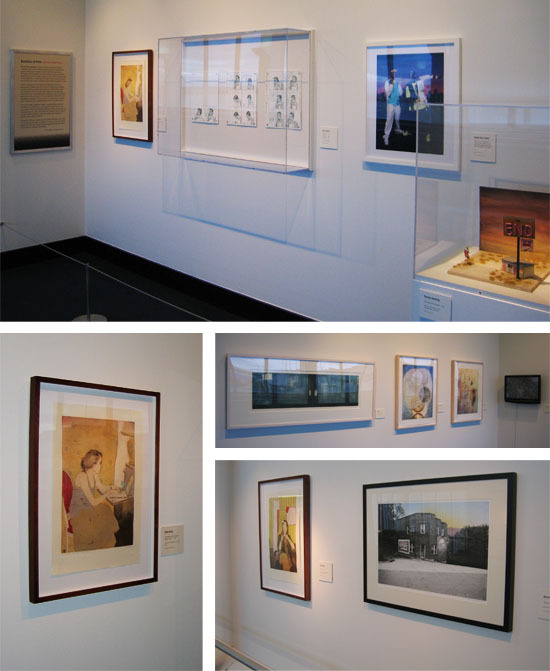 This entry was posted in Events, Kala Art Institute, Openings on September 1, 2009 by ellenheck.